The combination of butternut squash and warm spices with the piquant flavors of olives and preserved lemons give the stew the kind of sweet, salty and tangy complexity I can’t resist. This recipe is also proof (like I needed more proof) that you don’t need meat to make a hearty main course. This is about as satisfying – and nutritious – as it gets. This was adapted from an Aida Mollenkamp recipe, with additional inspiration from Martha Rose Shulman, an amazing champion of vegetarian cooking. 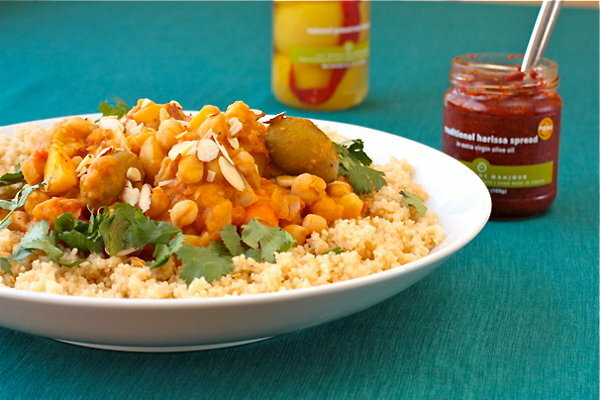 The harissa and preserved lemons are essential ingredients here, so do seek them out or make your own! While you can make this with canned chickpeas, I do hope you’ll cook your own from scratch if you have time (it takes about two cups of dried chickpeas.) Not only are they tastier than canned chickpeas, it will save you a few bucks. And who doesn’t need that? Heat the oil in a large dutch oven or heavy-bottomed pot. Add the onions, garlic, spices, salt and pepper and cook over medium heat for about 5 minutes. Stir in the squash, carrots and potatoes and cook for 5 minutes. Add chickpeas harissa, saffron, and tomatoes. Add vegetable stock to just barely cover the vegetables. Cook, covered, for about 20-30 minutes, until vegetables are tender. Season with additional salt to taste, then stir in the preserved lemon and olives. Serve, garnishing with the suggested additions as you like. Cathy is a Brooklyn-based food blogger who focuses specifically on heart-healthy food. A long-time foodie, she suddenly learned that she has hereditary heart disease. But she turned her health issue into a cooking challenge, and developed a heart-healthy, vegetarian cooking style that’s spicy, satisfying and adventurous. Cathy is on a mission to inspire others to eat the way she does, and shares her recipes on What Would Cathy Eat?